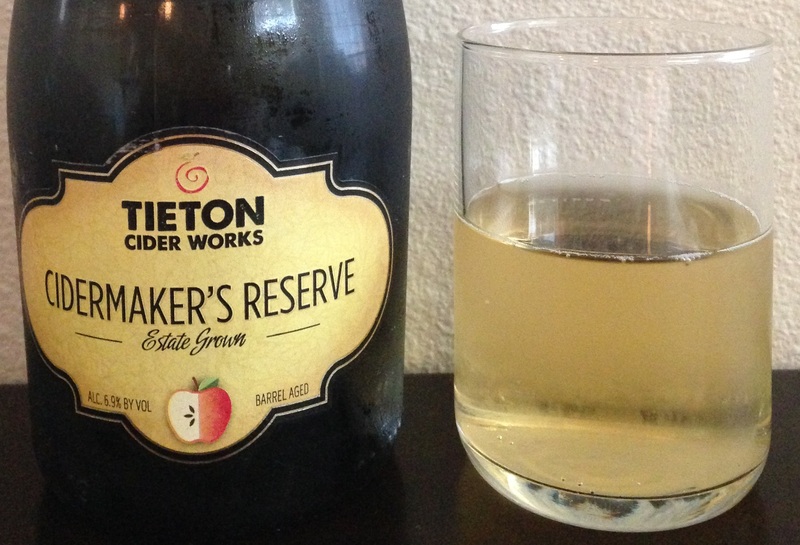 Review of Cidermaker’s Reserve from Tieton Cider Works. Availability: Year round. 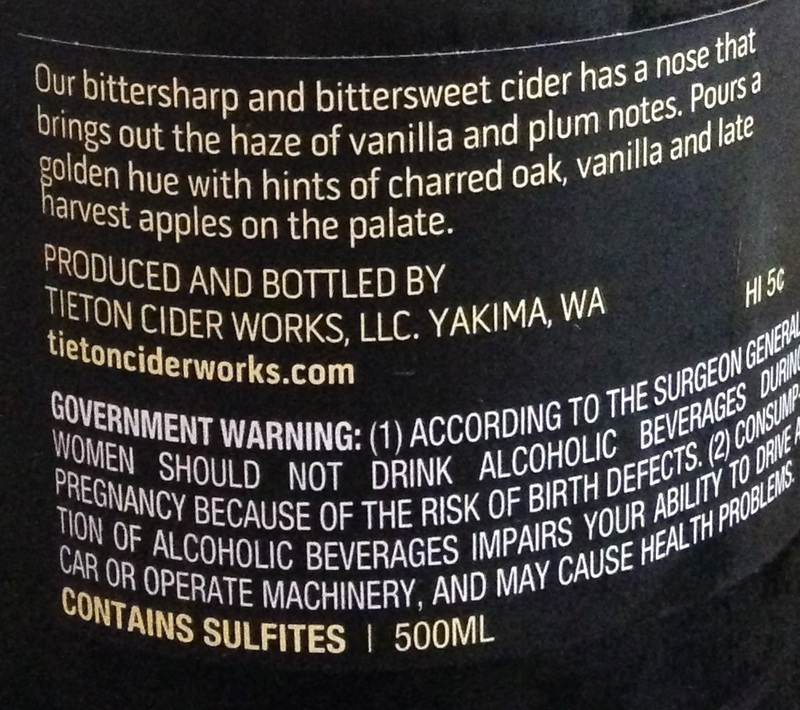 Tieton ciders are available in WA, OR, AK, HI, B.C., ID, CA, NV, MT, WY, UT, CO, AZ, NM, TX, FL, MI, IL, and OH (per their website). They also take orders by phone to be shipped in WA (info here) and have a tasting room (info here). Cider Description: This two-year-old bourbon barrel-aged bittersweet cider has a nose that brings out the haze of vanilla, plum, and slight bourbon notes. Pours a golden hue with hints of charred oak, vanilla, and late harvest apples on the palate. 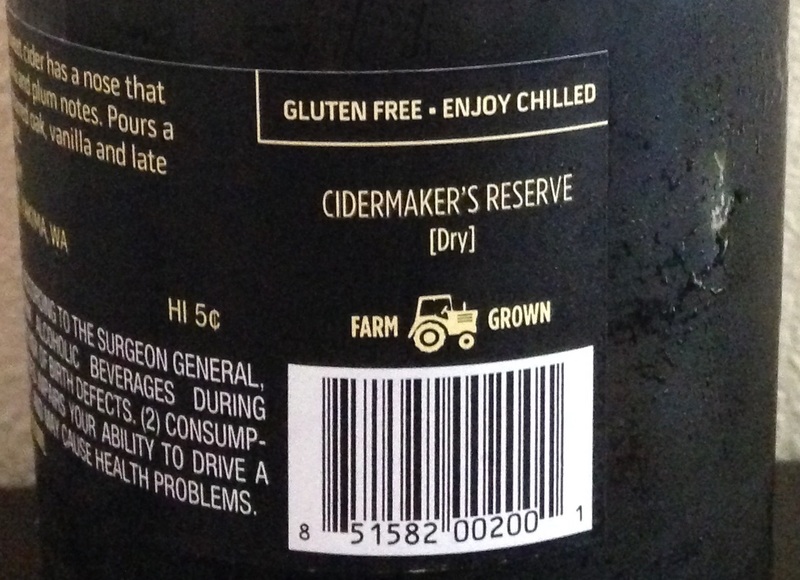 Cidery Description: We are continually asked: how did you get into the cider business? The answer is easy: we were in the apple growing business. Period. If we had not been a farming family, cider would not have held an interest. The fruit that is used in Tieton Cider Works cider comes from Craig and Sharon Campbell’s Harmony Orchards. This land has been in our family since the 1920’s when our grandfather planted his first trees in Tieton, Washington. We take our stewardship of the land seriously and have been farming organically for the last 25 years. As a third generation Yakima Valley farmer with a degree in horticulture from Washington State University and over thirty five years’ experience in marketing produce, Craig has always been curious about the back-story: the history, production, science, and industry of food. Growing different varieties of trees is truly what makes Craig happy and he is always looking for new varieties to plant and nurture. In 2008 he was introduced to cider apple varieties, those gnarly, inedible wild apple varieties needed to make great cider. He planted twenty five varieties in a test block of two acres to study the growing patterns: did each fit into the existing bloom and harvest schedule of the farm, what were the flavor profiles of the fruit and how did that variety add to the cider that we wanted to make. From that original twenty five, Craig has narrowed it down to the eight most suitable for commercial production, never closing the door on annual experimentation when he learns of a new variety. We now have the largest acreage of cider apples and Perry pears in the state of Washington with 55 acres. The Yakima Valley is the largest apple producing region in Washington and there is an infrastructure existing in our valley that provides many advantages when you are making cider. Whether we are storing our apples in controlled atmosphere, sending our apricots and cherries to be processed, or selecting the complementary hops and pumpkin for our seasonal ciders – it all exists in the valley we call home. A love of land, food and drink has inspired us to make cider with the fruit we are growing at our ranch, Harmony Orchards. We know the ciders we make are an expression of the harvest and reflective of the fruit and the place that it is grown. We are thrilled to be involved in re:interpreting the tradition of cider making. How Found: I’ve seen this cider at Total Wine, and even tried it awhile back (can’t remember if it was a tasting or an entire bottle). However, I wanted to give it another go as I didn’t really remember it, and am now more into drier ciders than I was a year or two ago. First Impression: Medium carbonation upon pouring. Light champagne yellow. Smells of ripe acidic apples and oak. Opinion: Dry to semi-dry. I definitely pick up the oak barrel influence, but it isn’t overpowering in the least. I also pick up some vanilla and bourbon notes. Moderate acidity, tartness, and bitterness. Medium bodied. Some astringency. Moderate length finish with some lingering acidity, tartness, and bitterness. Clean refreshing taste. Its awesome they are a Washington cidery and have such a large cider apple orchard. Overall a solid well-balanced and well-composed cider, but isn’t one of my favorites. It is tending towards the bold & unique category that I like, but not quite there yet. Most Similar to: Other local craft oak aged ciders I’ve tried such as Schilling Oak Aged, Finnriver Oak & Apple, and Snowdrift Cornice, although slightly more dry & acidic. Closing Notes: I look forward to trying more Tieton ciders! I’ve tried a good deal (Cidermaker’s Reserve, Apricot, Smoked Pumpkin, Wind, Wild Washington, Cherry, and Blossom Nectar), but this is the first I’ve reviewed here at Cider Says. I’d especially like to try their Sparkling Perry and Frost (ice cider) varieties. 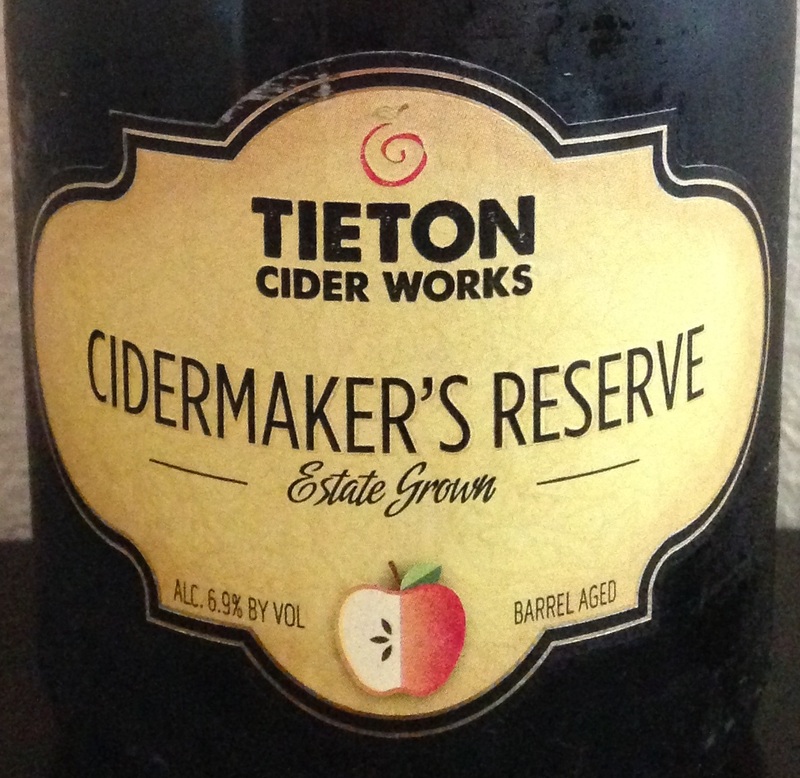 Have you tried Tieton Cidermaker’s Reserve? What did you think?